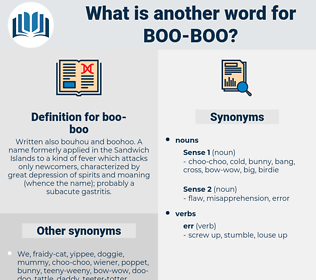 What is another word for boo-boo? Written also bouhou and boohoo. A name formerly applied in the Sandwich Islands to a kind of fever which attacks only newcomers, characterized by great depression of spirits and moaning ( whence the name); probably a subacute gastritis. certainty, accuracy, success, correctness, perfection, truth, correction. fact, honesty, strength, reality, behavior, obedience, surety, validity, achievement. cheer, aid, pleasure, healing, assist, help, ease, prosperity, win, relief, cure, joy, good fortune, luck, comfort, profit, advantage, miracle, blessing, kindness, remedy, benefit, happiness, health, gain. good, virtue, morality, assistance, flattery, delight, favor, compliment, goodness, praise. calculation, remembrance, respect, soundness, understanding, proof. exactness, exactitude, precision, infallibility, preciseness, strictness, inerrancy. understand, obey, behave, stay, correct.